How do I keep my Mills from paying out too often? The tube runs out because of the frequent payouts. Yes, I filled the tube and it does run out. 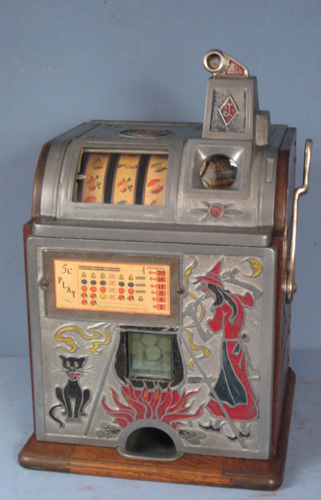 Everything else works fine--all payouts and jackpot. It's just that it pays out so often that the tube empties eventually, even though coins do drop into the tube as you play. Someone may have altered the payout dics. Are there any patches on the reel stripe. Patches, symbols placed over other symbols. If possible can you list the symbols on the three reel disc. It is possible that the wrong reel disc are installed. I'll bet it is paying on cherries quite often. If it is you may the wrong reel bundle in it. Do you mean the symbols for all three discs? Or just the one on the far right? It's a 2/5, if I understand you correctly. If you have a 3/5 reel bundle in a 2/5 machine it will payout on cherries like crazy. A 2/5 reel bundle only has like three cherries on the first reel. A 3/5 reel bundle will have like seven cherries on the first reel allowing for more payouts.